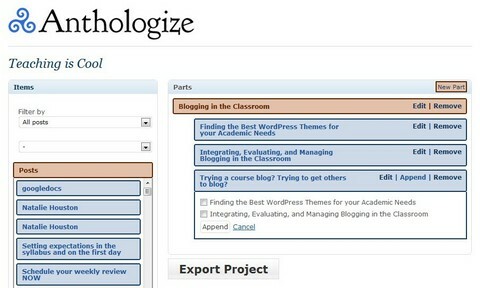 Anthologize is a free, open-source, plugin that transforms WordPress 3.0 into a platform for publishing electronic texts. Grab posts from your WordPress blog, import feeds from external sites, or create new content directly within Anthologize. Then outline, order, and edit your work, crafting it into a single volume for export in several formats, including—in this release—PDF, ePUB, TEI.